Americans love to complain about not getting the most desirable wagons and diesels from Europe, but always forget that the old continent is missing out on most US models too. With the 2015 Mustang going global and Ford expecting 10% of the sales ending up overseas, at least the wait for the pony is finally over. Even in such a small country as Hungary, you can run into prime examples of every Mustang generation from perfectly restored sixties classics through Mach 1s, the oil-crisis heroes known as the Mustang II (the cheapest entry to the club), tuned Foxes and the most common of them all, the fourth-gens. When it comes to the current Mustang, getting a European passport pushes it into a very different category. Not in terms of build quality or luxury of course, but by the time a Mustang gets here, it's not the cheap sport coupe you all love so much. Since a 2013 V8 costs roughly the same as a BMW 320i, you could still argue that it's great value for money as you get a 5.0 V8, but let's face it: the only reason for choosing the Mustang over the BMW is that it's a more entertaining toy to have. It's a slightly ridiculous but highly rewarding statement of extravagance. Chevy is way ahead of Ford as the Camaro is officially on sale here with its 6.2 V8, a great choice in the land of $7.50+/gallon petrol. Still, the fact that you don't have to deal with importing your car to the EU feels like a big bonus. It was clear from day one that the current generation of American muscle cars was not designed with the global market in mind. But Ford is right in saying that the age of significantly different model ranges is over. Everybody is downsizing, turbos are coming, carbon-dioxide molecules are going, so jamming a four-banger into a Mustang doesn't sound crazy anymore. Ford's European lineup could also use a poster car. Yes, the Focus and Fiesta STs are nice hot hatches, but that's about it when it comes to excitement at a Ford dealership. 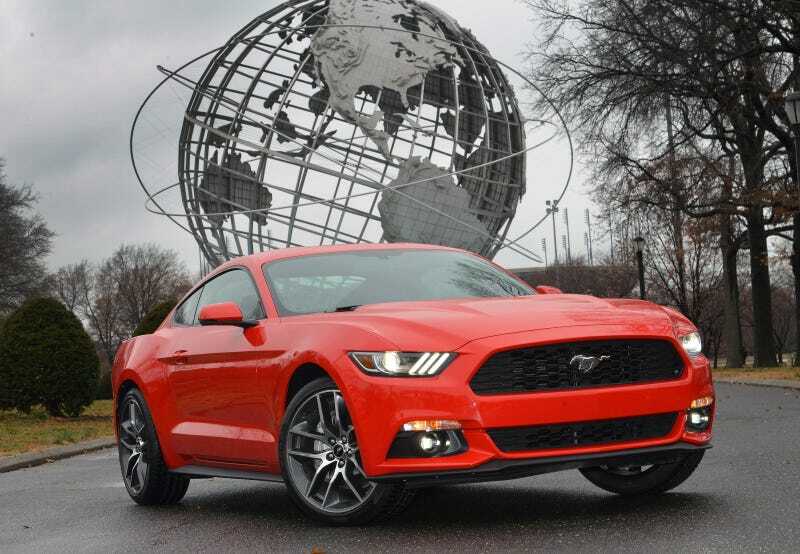 The 2015 Mustang will have independent rear suspension, turbo power returning competitive fuel economy and supposedly better materials since it has to work on both sides of the water. If the price is right, a car like that can really shake up a segment currently dominated by the Germans. After all, what's not to like about the Mustang's concept? Photo credit: archer10 (Dennis), photobeppus, apasp, Benoit Cars and Máté Petrány/Jalopnik.